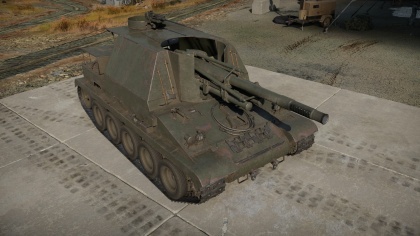 The Lorraine automoteur de 155 mm modèle 1950 (shortened as Lorraine 155 Mle.50) is a gift rank III French tank destroyer with a battle rating of 4.3 (AB/RB/SB). It was introduced in Update 1.77 "Advancing Storm" during the 2018 World War Two Chronicles. The Lorraine 155 Mle.50 has very little armour (although some are sloped enough to deflect certain low-rank rounds), and can generally be penetrated by most guns of its rank. Even worse, however, the 'casemate' (if it can even be called that) has very little armour, and in some places can be shot through with machine guns. The commander (operating the 151) is completely open to the elements. Generally, you want to rely on good map placement and mobility, rather than armour. Suspension wheels are 10 mm thick while tracks, sprocket wheels, torsion bars, and return rollers are 20 mm thick. Belly armour is 10 mm thick. 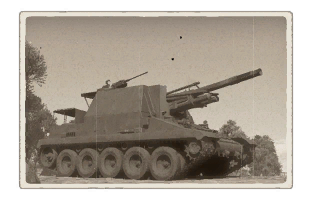 The best method of using the large-calibre weapon on the Loraine is to exploit the high-explosive power against thin-armour on the enemy. Like other large calibre HE tanks, shooting below an enemy vehicle will penetrate its belly armor. This is an effective, albeit difficult way to engage tanks whose armor is greater than what your HE shell can penetrate. Tiger I - While seemingly a hard enemy to face, the Tiger is easily dispatched with a side shot. A hit to the roadwheels will penetrate the tank, with the shell fragments going through the thin armor on the underside of the tank's sponson. This is also possible to do to Tiger IIs, but usually results in much less damage done. Tiger II P, Panthers D and A - a hit to the bottom of the curved turret face of these tanks will cause the HE shell to pen the roof of the vehicle. This can also be done on tanks with flat turret fronts ( Tiger I, Tiger II H, Panthers G and F) by aiming for the lower half of the turret, but is not as reliable. Prototypes of the Lorraine 155 Mle.50 passed trials in 1950, but never reached production. Skin and Camouflages for the Lorraine 155 Mle.50 in Warthunder Live. This page was last edited on 5 April 2019, at 15:40.